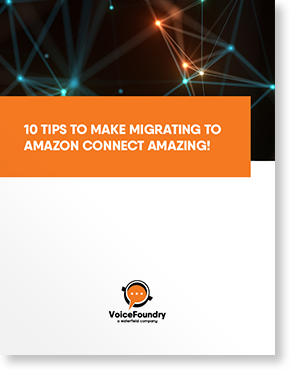 Free White Paper: "10 Tips on Migrating to Amazon Connect"
Tips to make migrating to Amazon Connect amazing! Learn: Understand the power of AWS and its game-changing differences. Assess: Conduct an assessment of existing technology and business objectives. Determine: Consider what you are doing for Advanced Automation. Evaluate: What is your vision for the customer experience?